According to a new market report published by Transparency Market Research titled ‘Wireless Earphone Market – Global Industry Analysis, Size, Share, Growth, Trends, and Forecast, 2018 – 2026,’ the global wireless earphone market was valued at US$ 5.10 Bn in 2017. It is expected to reach US$ 10.14 Bn in terms of revenue by 2026, expanding at a CAGR of 8.2% from 2018 to 2026. The market in Asia Pacific is likely to expand at a rapid growth rate during the forecast period, due to a rise in the number of premium brands and strong product innovation among manufacturers. The adoption of wireless earphones has increased across regions. Wireless earphone are cord-free and hands free and offer ultimate mobility. Moreover, many wireless earphones come with bass-boosting technology and noise-isolation feature. All these factors are expected to increase the demand for wireless earphone over the period of time. Apart from this, penetration of smart devices such as smartphones, tablets, laptops, streaming media players, and various other devices is likely to drive demand for and adoption of wireless earphones during the forecast period. However, the entry of new players and competitive prices offered by them are creating pricing pressure for established players. This is likely to reduce profits of established players, thereby resulting in a decline in investments during the forecasted period. In terms of type, the canal earphone segment is likely to offer significant expansion opportunities as canal earphones offer east fit and convenience. In terms of connectivity, the Bluetooth connectivity technology segment is expected to maintain its market share, owing to the rising adoption of portable devices such as smartphones, mobiles, laptops, and tablets. In terms of application, the sports & fitness segment is expected to expand at a rapid CAGR during the forecast period. As compared to the gaming & virtual reality segment, the music & entertainment segment is expected to constitute a higher market revenue share in the coming years. In terms of distribution channel, the online distribution channel segment is expected to expand at a robust pace during the forecast period, owing to the rapid penetration of Internet services across the world. In addition to this, technological advancements and a rise in the number of smartphone users are expected to boost the online stores segment during the forecast period. In terms of market type, the mobile aftermarket segment holds a key share of the wireless earphone market and is expected to maintain its share during the forecast period. At present, smartphone manufacturer’s offer wired earphones with the mobile inbox. As a result of this, consumers are inclined toward the mobile aftermarket. In terms of region, Europe accounted for a dominant share of the wireless earphone market in 2017. North America also accounted for a prominent share in the wireless earphone market. The U.S. is a significant country of the wireless earphone market in North America. The market in Asia Pacific is anticipated to expand at a rapid CAGR during the forecast period. The market in India and China is likely to expand rapidly as compared to that in other countries. The market in Middle East & Africa and South America is expected to expand at a sluggish pace. The wireless earphone market consists of a large number of public and private players. Market players focus on developing new products to meet the changing consumer preferences. Product innovation, technological advancements, and acquisitions are the key competitive strategies adopted by the top players in the wireless earphone market. Prominent market players profiled in the research report include Skullcandy, Harman International Industries, Sennheiser electronic GmbH & Co. KG, Plantronics, Inc., Bose Corporation, Sony Corporation, Jabra, Koninklijke Philips N.V, Apple Inc., Samsung, Motorola Mobility, Huawei Technologies Co., Ltd, Bang & Olufsen, Edifier International Limited, Panasonic, Shure Incorporated, Xiaomi, Nokia, LG Electronics, Inc., OnePlus, and Motorola mobility (Lenovo Inc.). 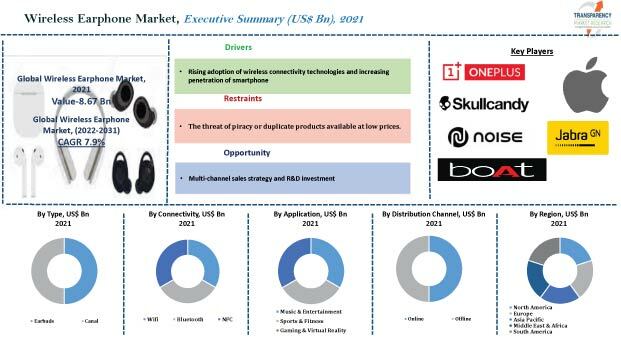 The report also offers competitive landscape of the key players in the wireless earphone market.